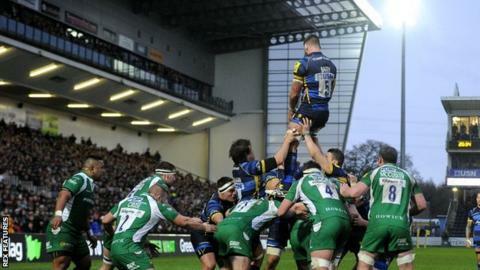 Worcester boss Dean Ryan says the return of the old crowd roar to Sixways is due reward for his players' effort. Warriors' timely run of four straight victories, for their first time since becoming a Premiership club, has all but guaranteed their safety from relegation with four matches left. Ryan says the home crowd have played their part with noisy support. But he points out: "I've always said that crowd support is in direct relationship with effort on the field." Ryan told BBC Hereford & Worcester: "It makes a huge difference when you've got a big collective at home and massive support. "If you get effort on the field, you could get crowd support. That is really starting show in significant amounts and is a real credit to everybody." Warriors are yet to reach their 12,024 capacity this season, having last sold out for a game in May when they beat Bristol on aggregate in the play-off final thriller at Sixways. But five of their nine home Premiership games so far have been shown live on television, which would have had a bearing on the size of their home gates. Saturday's 12-6 win over London Irish has taken Worcester to what should be a safety mark of 34 points, 16 points clear of trouble. But they face a stern examination over the final month of the season, with all of their remaining four games against sides currently in the top five. Ryan's men go to second-placed Exeter on Saturday, host Wasps on 16 April, visit fifth-placed Leicester on 30 April, then play at home to champions Saracens at Sixways on the final day on 7 May. "Clearly winning games helps, but there seems be a general uplifting of spirits in the crowd, and it does make a difference to the team. The atmosphere against Gloucester was electric. "Before, there was a certain apathy about the place. Losing games in the last few minutes and some dour European games didn't help. "But Francois Hougaard has come in and is already a big fans' favourite. And it's a bit of a chicken and the egg situation - the team does well, the crowd gets going and players then respond to the crowd."